***Updated 12/18/17 Just popping in to let you know that the winners of the two little giveaways are Jessica and Marlene. Girls, I'm excited that neither of you seem to be bloggers but you emailed me! I hope you will see this and email me again so I can get the gifts to you. 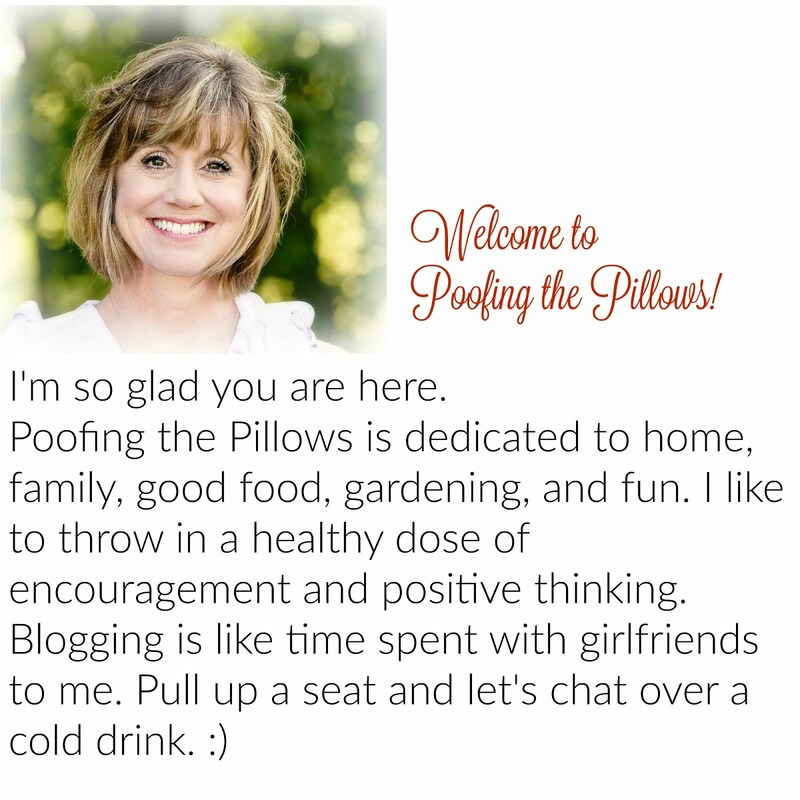 stacey@poofingthepillows.com Please include your email address in the message you send to me. Good morning friends, I'm so glad you are here. 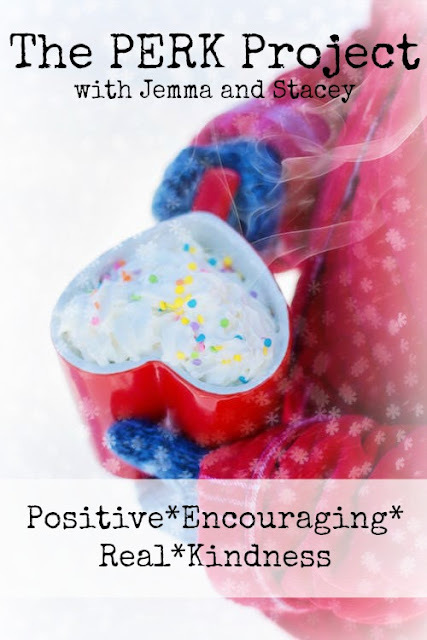 Jemma and I began the PERK Project a few weeks ago with the intention of sharing - Positive*Encouraging*Real*Kindness. The project took off with a bang and you all seemed so enthused. Thank you for that! Life went a little awry and we had to press pause but now we are back again and the subject this week is encouraging others. *Encouraging people smile at you often. *They want to know how you are doing and will check on you with a call or a visit. *Encouraging people remember things about you and your family. 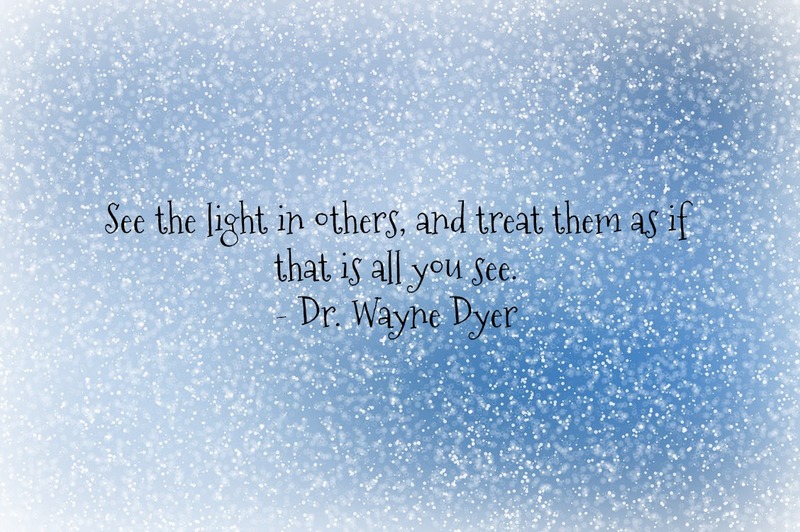 *They want to build others up and look for ways to do that. *Encouraging people give hugs and pats. *They remember others in their thoughts and pray for them. *I know someone who is an encourager and she never misses the chance to send a sweet card. *They make time for others. *They help others without being asked. I know several encouraging people who are always preparing meals for someone in need or driving someone. *They help others with things they have or financial resources. *They say thank you even when you don't expect it. *Encouraging people see your strengths and will voice them. *They tell you it's going to be ok.
*Encouraging people see the sparkle! *They let you know you are important in lots of little ways. *Encouragers never give up on others. *They make time for you and time to be together. *Encouraging people see what's wonderful and they share it. 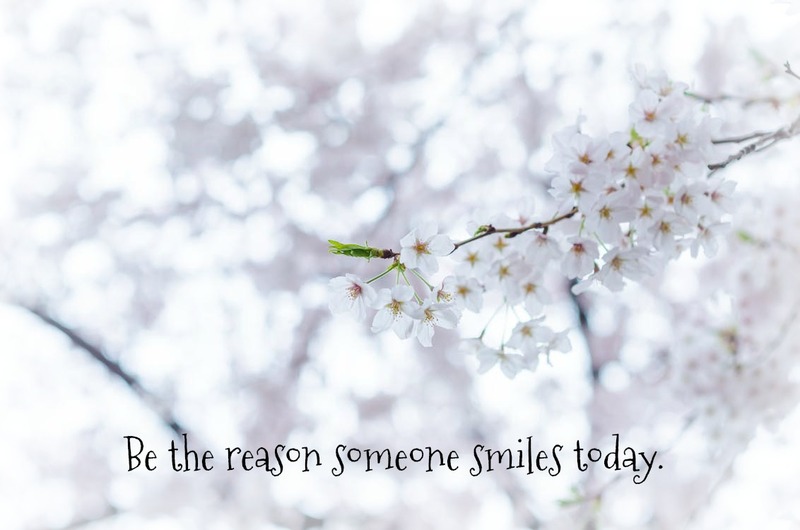 I bet you can help us think of a million other ways that encouraging people make you smile. Please leave your ideas in the comments and if you share, let us know how those people make you feel. Better yet - if you are an encouraging type of person, share what you like to do to build others up. 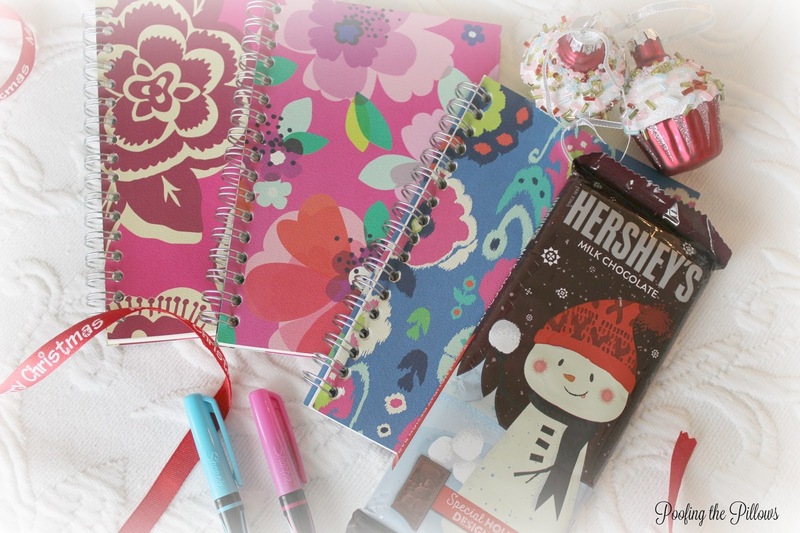 Remember when I shared Two Christmas Gift Ideas Under $10? If you leave a comment on this post or by emailing me at stacey@poofingthepillows.com you'll be entered to win one of those gifts from me. I'll be drawing the name of two winners on December 17th. Now be sure to pop over to my friend At Home With Jemma to see what she has to share today. Remember y'all - go out and brighten someone's day with a little positive encouragement. I think encouragement is so important, especially in the world today. All of us get down at times no matter how positive a person we are and we need to lift up and support each other always! A boost of encouragement can make all the difference! Can I mention again how much I love this series And you ladies! I was just thinking about my blog friends and those that write emails and how much that encourages me. I like knowing things about my friends and praying for them. And I always have an encouraging word. But having said that....I need encouragement too. Yesterday someone wrote to me and said I inspire them. I held on to that all day and it made me feel good! Thanks for this series! It came at the perfect time for me! Holiday hugs! What a joy it is for me to live next to my friend and encourager! Yes, encouragers see the sparkle in life, the silver lining in gray clouds and hope in tomorrow. Just like living a life with positivity living a life with encouragement is a choice and when we choose to live that way life is sweeter for not only others but ourselves! Sending much love to you!! I just love this and love you two! Jemma is so right in her comment above. You must choose to be positive and encouraging. Sometimes we can all start to feel that pull to negativity, but if we recognize it, we can put our hand up and say "Stop! I'm not heading in that direction. I'm going to look at the hilltops - not the valleys"
You are the best at encouraging, Stacey. Keep on keepin' on. The biggest ledge that we all as women need to move to the edge of is having the courage to edify other women. It is one of my favorite things to do . My simplest way to do this is in that instantaneous, spur of the moment complimenting of someone else. "You are such a blessing-"
All good points and all so true. I love it when I get a text or a note etc saying they prayed for me today. Let's me know I was on their mind. Love this Perk Project. Keep it up! Encouragement is such a gift that we all can use and need, year round. Sometime just a little smile and compliment can make someone's day happier. It's a great idea to promite this Stacy and Jenna! I have always said I am better at encouraging others to reach, expand, discover than I am doing it for myself. That's why I am so grateful to those who have encouraged me with my painting through when I post things on my blog and who have even come through and bought things I've done. It's so important for people to know they are valued and that someone is in their corner, has their back, so they can go out on a limb and try something new or take a chance. Just having someone believe in you is a great motivator. Just being able to listen and support someone else can make a huge difference in their lives. And it feels pretty good to the listener, too. I love this series. It's fun to go back and read the comments. Dear Stacey, Such a beautiful post to begin my day. Yes, it is so important for us to be encouraging to others by being present. Available for kindness, prayers and thoughts that lead to being helpful. My mother was an encourager to all she came in contact with and I watched her gift to others in this way and it impacted my life greatly. We just never know the daily ups and downs a person is going through or with a member of their family. I can say, through my journey as an artist, the encouragement I have received over the years has been the fuel to keep going. My goal is to pass that on to others always as I learned from my mother. In the end, we always receive a great gift of joy by taking time to give of our self to others even in the smallest of ways. I'm loving the PERK project! Encouragement goes such a long way in today's trying times. I always strive to be positive and encouraging. I love your list of things encouragers do! As an artist, I like to gift people with small paintings but truly anything that gives someone a smile works. Thank you, Stacey and Jemma, for being such great encouragers! This is a fabulous project! There can never be enough positivity, encouragement or love in the world! Reminders like this help us to stay focused on being intentional about our words & actions. Stacey, I do love this project and what you have shared today! The gift of encouragement is beautiful and sometimes rare. But, don’t we enjoy being around those people who encourage us. Thanks for sharing your precious thoughts! Good morning Stacey. Love this series. Encouragement is one of the best things you can gift or share with everyone. It is a one size fits all gift. I love to encourage my younger grand girls. My sweet Abby that is 7 years old helped buy and pack 6 Operation Christmas Shoe Boxes this year. I encouraged her to participate in this sharing I do each year. She was right on board after encouraging her to share with others less fortunate. We had 3 boys and 3 girls her age and I loved seeing her go through the store and pick out varies items to put in each of the shoe boxes for less fortunate kids her same age. Does your heart good to see that even younger kids can be encouraged at this age to help others less fortunate. In a world of so much violence it is good to see good start at a young age. Love ready all the encouraging words here on the blog. Thank you i have enjoyed all these posts and look forward to them. I do like to be super nice to people that wait on me, whether in restaurants or shops because you may be the only nice person they see. I hope you have a great Christmas and Happy New with family and friends. I love this, what a great idea!! You are one of those people!! After months of me not bloging, you sent me an e-mail to check on me and encourage me to keep going!! That touched my heart!! Thank you so much for being so sweet and kind! Thank-you for encouraging all of us, Miss Stacey. The PERK Project posts are so dear and precious! One of my daughter's fifth grade teachers encouraged her students to be a balcony person: to lift people up. She discouraged them from being "that basement person," always dragging others down. My daughter is now a college professor and PhD student, and that fifth grade lesson has stuck with her, and she treats her undergrads based on this principle. What a sweet life lesson from fifth grade that stuck with my daughter for almost 14years! I have a friend & former co-worker, who is my "encourager" for lack of a better term. She moved away a year ago, and I didn't realize how not being around her for 8 hours a day would change my attitude. But it did, it was missing finding the humor in little things, being able to make fun of myself for being grumpy for some absurd reason, it was missing that encouraging attitude and "hey we got this" mentality. No that I have really figured out what I missed so much, I try to do the same for others. The store clerks, waiters/waitresses etc. And it is so nice the responses I get, especially in the super frantic time of Christmas. They just light up when you talk to them and speak with a kind happy voice. I had one lady say how she wished she could give me a discount for being so pleasant and pretty. lol She was my blessing that day...we had a hoot while she was checking me out. What a fabulous post, Stacey! So wonderful to read something uplifting after all the bad news on TV these days. Hope you have a wonderful weekend!! Well, you are definitely the right person to write this post! You are always leaving encouragement everywhere you visit! I was just telling my "soon to be a teacher" daughter about the best teacher I ever worked with. She would write interesting a new and positive comments on EVERY. SINGLE. PAPER. she graded. Students loved to get spelling tests or assignments back to see what she had written to them. I am sure they worked harder for her because of this extra effort on her part. I love this post. I have to say, I'm a smiler. I smile at everyone and 99.9% of the time, I get a smile back. I love that!! Encouragement is so nice, I really do believe it makes us all better people! I love it when someone remembers details I told them and asks me about them later, or just checks in on me and gives me a little encouragement. It makes me feel like I'm being heard/seen, etc. Thank you for this sweet giveaway, fingers crossed! 1 Thessaloninas 5:11 Therefore encourage one another and build one another up, just as you are doing. 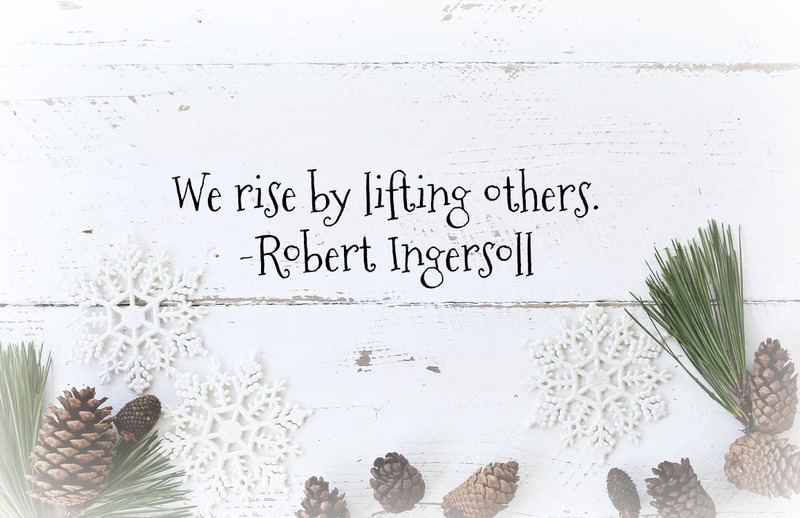 In a world where it seems everyone is in it for themselves, and where so many feel unloved and uninvited, it is such a blessing to find that one person who no matter their current circumstances nor how busy their own personal lives are look outside of themselves and take the time to uplift someone else. I am thankful to have a few in my life who encourage me daily. Okay, i hope you get this, 1825 e.tenth, Shawnee, Oklahoma 74801.